The Guinness Book of World Records is pretty weird. There are lots of records, and no doubt a bunch of them are doughnut related. The world loves doughnuts; Americans really love doughnuts. There’s a doughnut holiday, and we’re even looking into making getting doughnuts a lot easier. The city of Hamburg Township, Michigan, really loves doughnuts, so much so they want to break records with their tasty round treats. 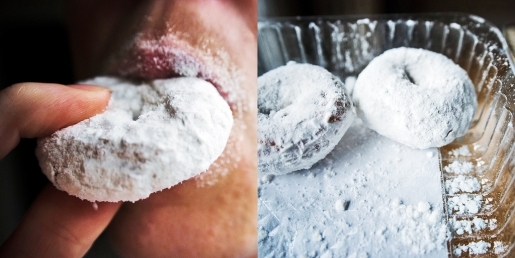 The Hamburg Mile was actually over two miles of doughnuts laid end to end, all in an attempt to break a world record. The old record was 1841 feet 10 inches, set last year in Germany. For comparison, a single mile is 5280 feet, meaning that Hamburg laid down 11,310 feet of doughnuts, which is kind of overkill when it comes to getting into Guinness. A surveyor did the measuring, and witnesses verfied, and those statements will be sent into Guinness to claim their rightful place in the record books. A machine attached to a tractor dropped the doughnuts; volunteers made sure all the doughnuts touched. Don’t worry about waste; the days-old doughnuts will now be fed to some very hungry farm animals. All the donated doughnuts, save 10, were used in the feat.